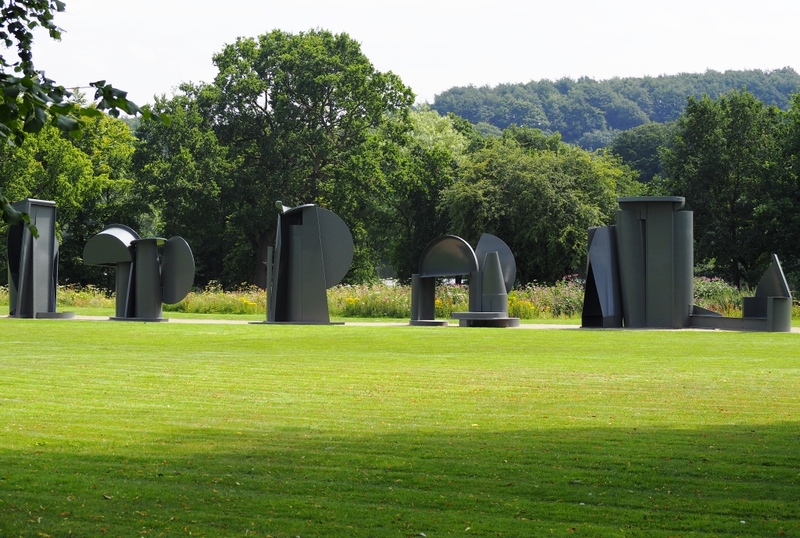 On a recent visit to South Yorkshire for family reasons I took time out to visit the YSP near Wakefield. I vaguely remember Bretton Hall from my teenage years living in Wakefield, but haven’t been there in donkeys years. 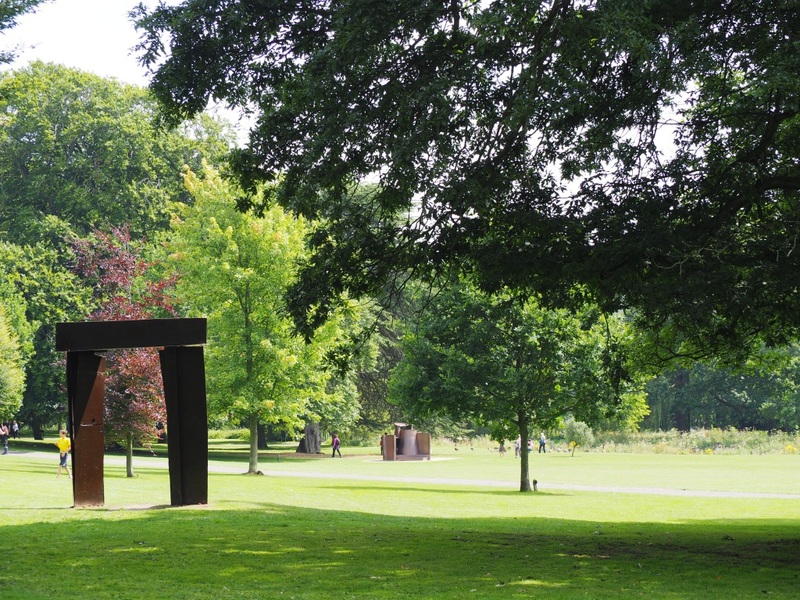 Today the park hosts exhibitions both indoors and outdoors as well as permanent sculptures in the grounds. The way one views sculptures, as with many forms of art, is highly subjective. Some I loved, others puzzled me, but the setting is great and if nothing else you get a good workout walking around the different parts of the park. Tony Cragg an artist who is now based in Germany has produced many bodies of work and examples here are from Early Forms (based on different vessels such as test tubes, jars, conical flasks) and Rational Beings (based on drawings of people). The sculptures are designed to be viewed differently from various angles and change depending on the perspective of the viewer. Tread Softly is an Arts Council Collection National Partner exhibition exploring the realities of childhood, developing identity and family relationships. I was particularly taken by an old gymnastic vault, which took me back to my grammar school days and a particularly strict P.E. teacher. I also liked Barbara Hepworth’s Family of Man placed on a hillside, though being roped off rather spoiled the effect. I enjoyed the juxtaposition of a real family enjoying a picnic lunch nearby. Decorating a hillside in the Country Park section are several bronzes of Henry Moore’s Reclining Figure series that he began in the 1950s, and returned back to again and again throughout his life. 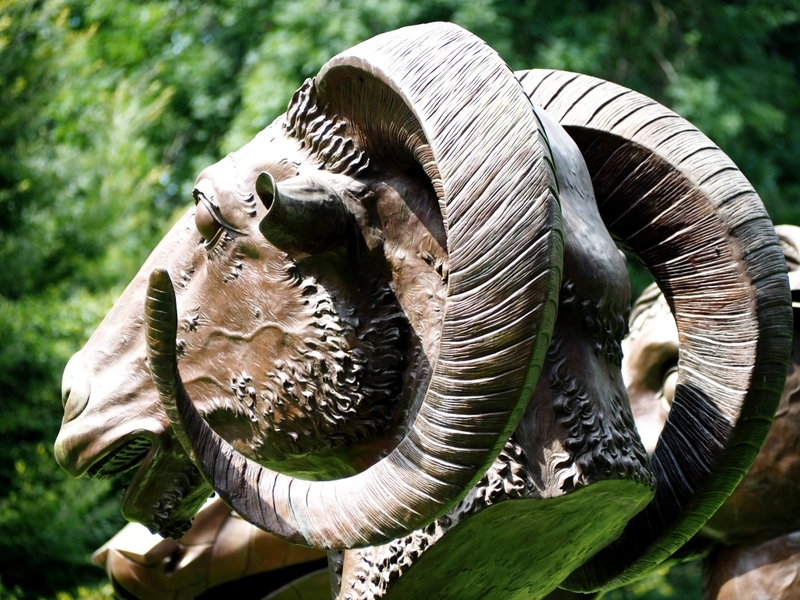 I enjoyed the patina of the bronzes; the sheep enjoyed the shade. Al Weiwei’s Iron Tree is a delightful replica of the ancient yew trees found in the Chapel grounds. and his Circle of Animals / Zodiac Heads is very interesting and has been on a world-wide tour since 2011. For the duration of their exhibition in Chicago all the heads were hooded, to remind people that the artist himself was still confined to China after being arrested for ‘economic crimes’. In 2016 he was granted permission to travel to Prague and see the sculptures for the first time. Apart from the sculptures, the park is a very pleasant place to stroll around with walks around the lake, split into two by the Cascade Bridge which is where we will begin part two. IF YOU ENJOY A WALK, LONG OR SHORT, THEN HAVE A LOOK AT JO’S SITE WHERE YOU ARE WELCOME TO JOIN IN WITH HER MONDAY WALKS. It’s quite brilliant Su. I’d certainly go there again. I’d never been particularly interested in sculpture before I went there, so it was a kind of a life-changing experience, given how involved I got in the organisation of sculpture exhibitions more recently. 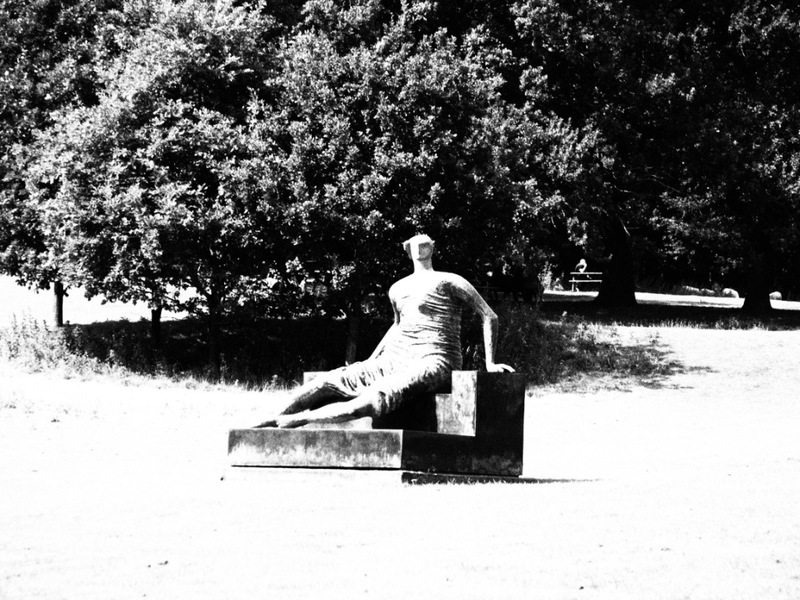 YSP looks a most interesting place…thanks for the virtual tour, Jude! I had heard of it, but never been, which as a Wakefield lass seemed wrong. Staying in nearby Doncaster gave me the chance and I’m glad I went. What a fabulous inspirational place. Have of course seen views on the TV, but it’s lovely to have a personal tour with you. 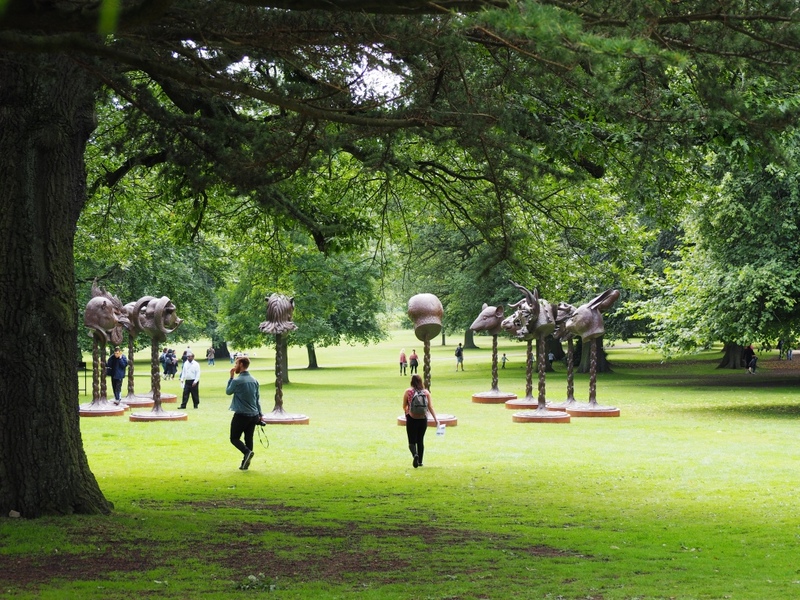 The Henry Moores are special favourites, but Al Weiwei’s Iron Tree (with (un)intended sheep) is wonderful. 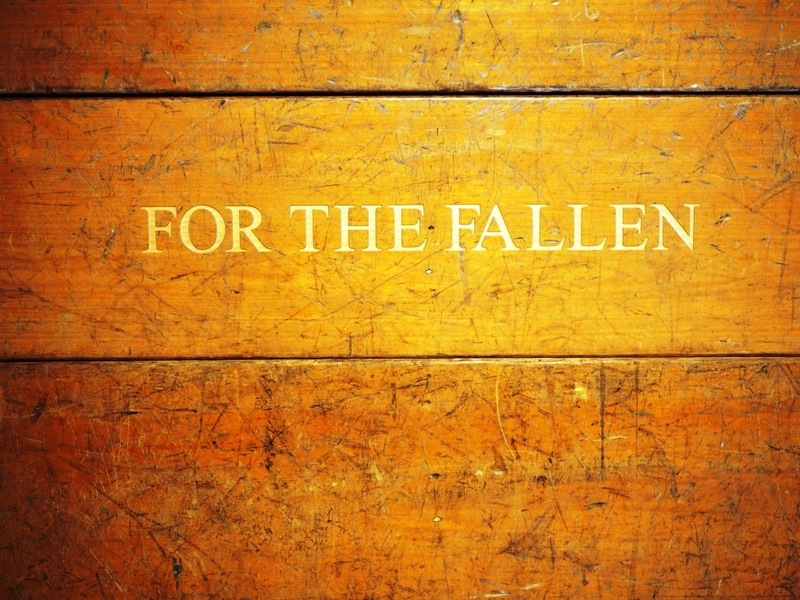 it is very inspirational – I missed several of the exhibits, but was too tired to backtrack. A place you could go to often if it was near enough as they change the exhibits and even without them it is a lovely park to walk around. I had a wonderful time there too not that long ago! Must share my photographs soon 🙂 Did you play on the musical chairs?! Must have missed those. There was something where the music changed according to where you stood, but I didn’t know that until later. ah yes that’s where the chairs were too . . . I discovered that you could play music from them as well. I will have to share the photos of me, was hilarious! The first photos – really fantastic shapes! Must be great fun to go along. The trails aren’t very clear so I kept missing sculptures, but I had a lovely day wandering around, just stumbling on the exhibits. Some great images of a very interesting place. I love to see large sculpture outdoors. Must try to get to that place one of these days. It’s a lovely park and the sculptures just make it a bit more interesting. Some really do fit into the landscape. Some I like more than others but I do admire the work that goes into each piece. I’m always interested to read the meaning behind sculptures as that often gives you an insight into what is being represented. 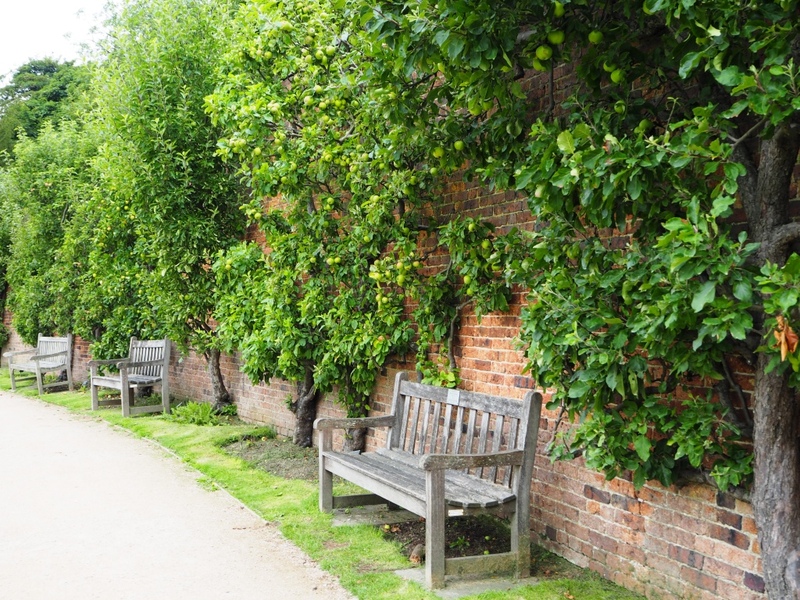 What a wonderful place to take a walk … there is just so much to attract your attention! The header photo of the man on the ladder with the Buddha is a good one for giving the size of the Buddha some perspective … and you’re right about the Family of Man. The fencing detracts from the exhibit. I’m assuming the blocks are free-standing and would pose a risk to anyone if they toppled over. I loved it that the sheep just wandered around the sculptures in that part of the park. As for the Family of Man, I believe they were cordoned off to stop people climbing / touching them, which is a shame because I think most sculptures just invite you to touch them. I have been able to in the Barbara Hepworth garden here in St Ives. 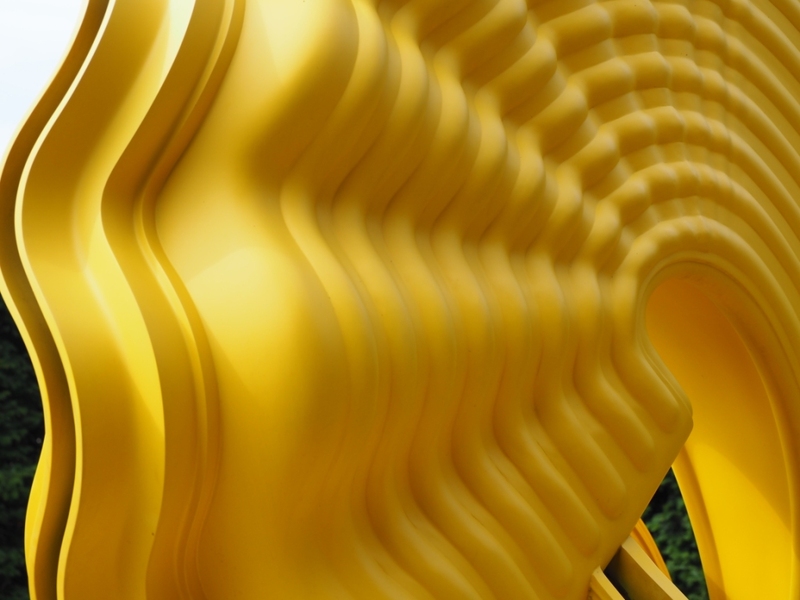 I wasn’t too keen on Tony Cragg’s work either with the exception of Outspan which I liked. Naturally I took a photo of each animal from the Circle of Animals, they really are great. 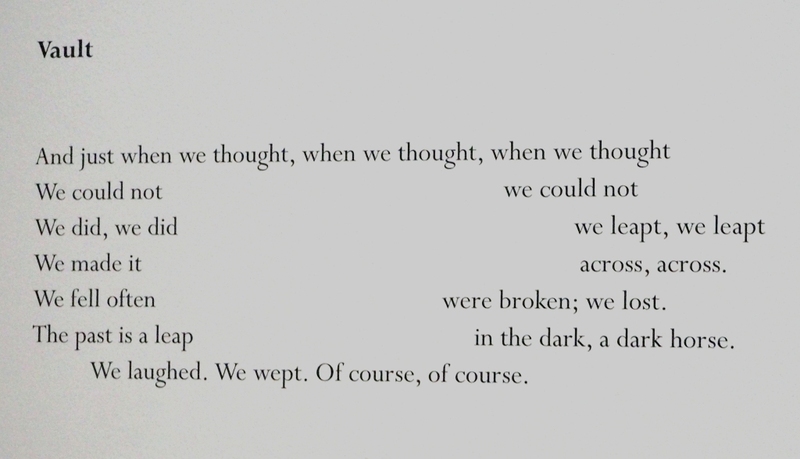 Hope you’re feeling a bit more lively today, and knee deep in hugs. 🙂 Thanks a lot for the link. You’ll have to try again when next visiting the family in Leeds. Riverside walking eh? I didn’t know you could walk along a river to Whitby. Guessing this might be next week’s walk? I did think we might. James is off to Lisbon on a stag do this weekend and after that we start to run out of time before we go. Checked Ryanair flight cancellations and none of us are affected. Phew! 🙂 🙂 From Ruswarp, which is a lovely little spot just a mile inland on the Esk. I think I’ve featured it before, so probably not. What a place to wander. 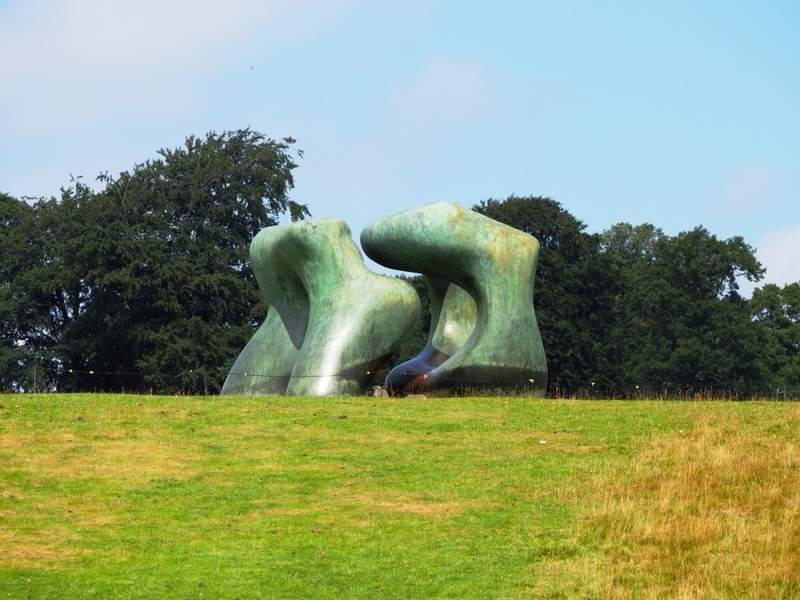 I’m always a fan of Henry Moore, and you gave me more insight into his thinking. I came across a sculpture similar to the draped woman in Melbourne and spent a bit of pleasant time with her,chatting about things women chat about. I thought ladder man was part of the sculpture – definitely possible. Thanks for a lovely stroll. 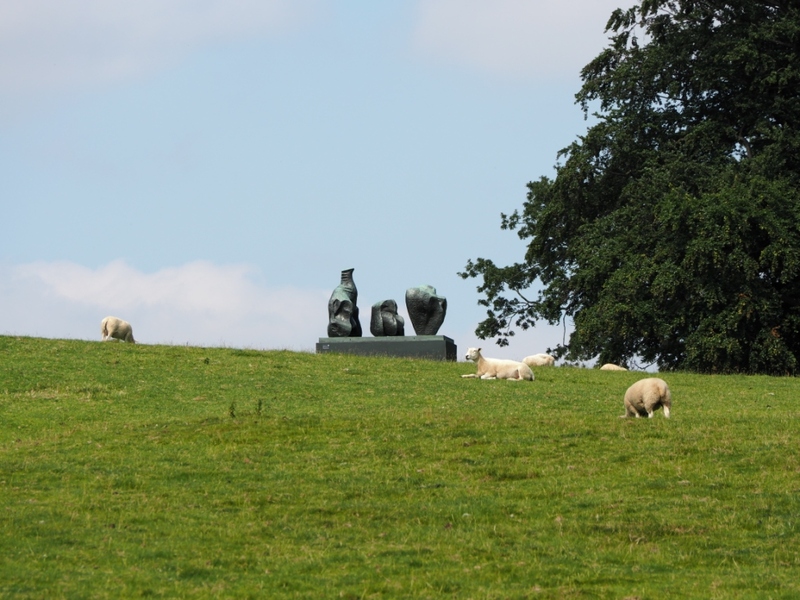 The Henry Moore sculptures were lovely, scattered across the hill as they are, even though it took a bot of huffing and puffing to get to them all. I love the patina on the bronze, which is why I love Barbara Hepworth’s work too. So tangible. What an amazing place Jude. I’d never heard of it until you posted. I’m not sure how long it has been open, but I knew there were some Hepworth sculptures there from my visit to her garden and studio in St Ives. I guess Moore’s sculptures all look similar as they are based on this ‘sitting lady’ concept. What a wonderful way to enjoy sculpture; one has the room to step back and appreciate the immensity of some of these works, which unfortunately is lost in closed spaces. Henry Moore, Ai Wei Wei & Niki de Sant Phalle are some of my favourite sculptures and I so appreciate the opportunity to see them in this light. Thanks for popping in PP – I am glad you enjoyed the sculpture park. It is a fabulous big space and the sculptures are well spread around so you can absorb each one without interference. I think that is so very important when enjoying art: Space. Actually, it is nice to have space in many other circumstances too! Thank you for that shot.